Christian Community in UnityThere will be 3 community events on 3 consecutive nights taking place in Madisonville, Ky, Friday thru Sunday, September 18 – 20 all for the purpose of uniting the Body of Christ and impacting the community with His love. The first event, “Your Kingdom Come Community CROSS-WALK” will begin with people assembling at Trover Clinic parking lot at 6:30 P. M. on Friday, September 18. Personal crosses will be provided for volunteers to carry as we walk thru town, stopping to pray for our local cities, counties, state, nation, leaders, and then proceeding to the Hopkins Co. Fairgrounds for a time of worship, hearing the word, and prayer! PLEASE TOUCH THE “JOIN BUTTON” IF YOU WILL BE ATTENDING THIS FIRST EVENT SO WE CAN PLAN ACCORDINGLY WITH HAND CROSSES, AND ASSIST THE MADISONVILLE POLICE DEPARTMENT IN MANAGING THE FOOT TRAFFIC THRU TOWN! 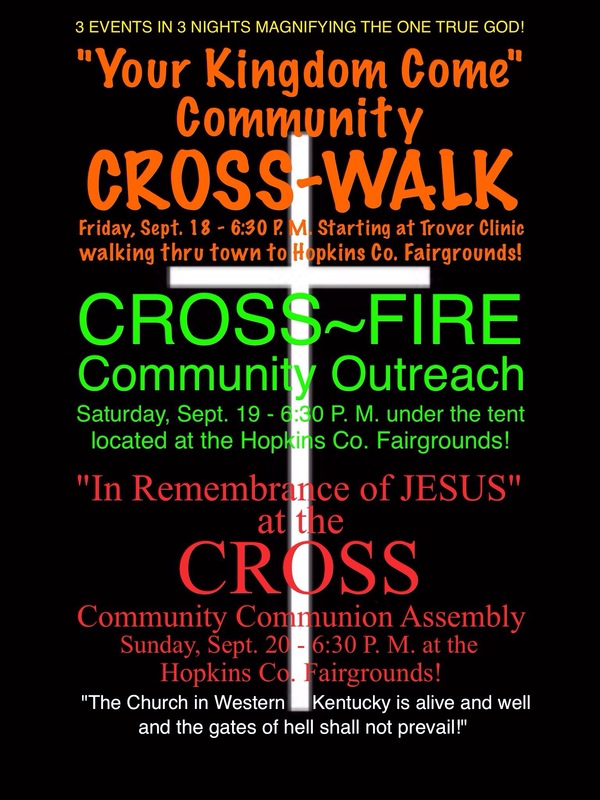 The second event, “CROSS~FIRE Community Outreach” will take place at the Hopkins Co. Fairgrounds under the tent and begin at 6:30 P. M. on Saturday, September 19. This event will begin with a time of worship, personal testimonies, a message of hope, and then a time of prayer to receive salvation, healing, freedom, and restoration in His presence! The third event, “In Remembrance of JESUS at the CROSS” will take place at the Hopkins Co. Fairgrounds starting at 6:30 P. M. on Sunday, September 20. This event will begin with a time of worship, prayer, self-reflection, the serving and receiving of the Lord’s Supper, a message of unity and encouragement, and celebration of the rule, reign, and soon return of King JESUS! The Church in Western Kentucky is alive and well and the gates of hell shall not prevail! ALL ARE WELCOME! PLEASE COME!